In this episode, fiction editors Leslie Watts and Courtney Harrell critique the first chapter of Seeker, a science fiction novella within the Chaos Nova universe by Smith & Kaos. They discuss conflict within stories and scenes. 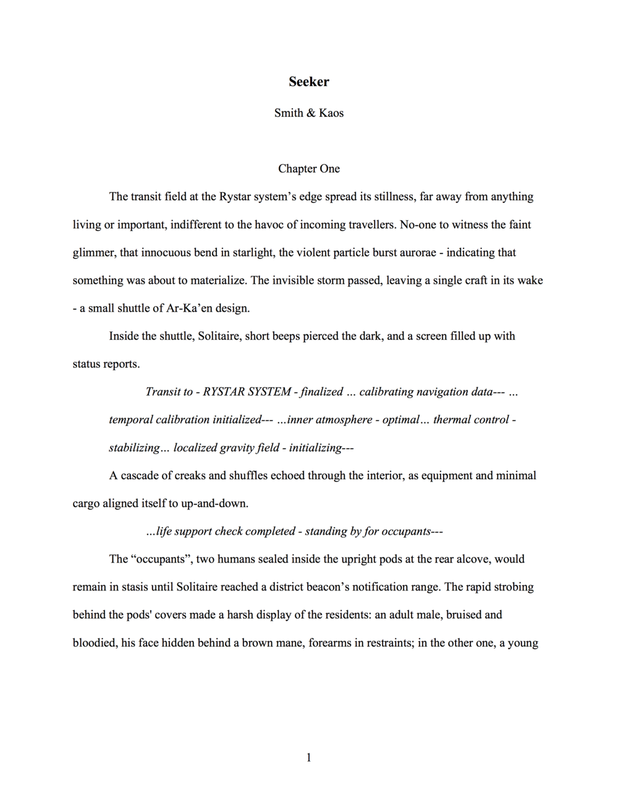 UPDATE: Smith & Kaos revised their opening scene after hearing our feedback. You can see the changes they made after the original submission. Antagonistic forces and obstacles are necessary elements of stories because change within a character comes as the result of dealing with conflict. It is the vehicle through which they change over the course of the entire story, but also incrementally, scene by scene. Conflicts delay the resolution of every unit of story (scene, sequence, act, story). If the character achieves a goal for the unit of story without effort or worry, then tension drops and narrative drive wanes. Even if your story overall has great conflict, you’ll tell a better story if each scene contains robust conflict as well. This week’s editorial mission shows you how to analyze your scenes for conflict so you can make things as tough as possible for your characters. 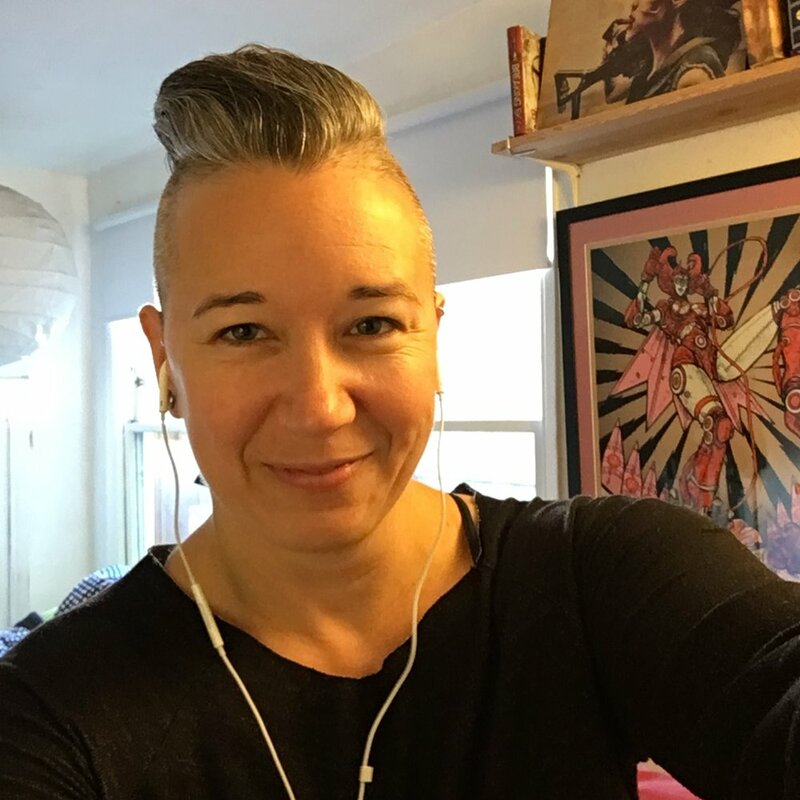 Courtney Harrell is a Certified Story Grid Editor and writes middle grade fiction with diverse characters, including LGBTQ and gender fluid characters under the pen name Foenix Ryder. You can find Courtney online at FoenixStorytelling.com. How does a scene provide interest? He is an audiobook narrator and is registered on ACX if you are interested in working with him on your project. Also, because one shameless plug is never enough, you can check out his proof reading skills and get your hands on some super steamy paranormal romance by heading to jennifermancini.com. Killjoys is the science fiction bounty hunter story that Courtney mentions during the episode. Join the Writership Quarter Masters Book Club! Each month I'll choose a book from your suggestions. We'll read it and, together in a (virtual) book club meeting, analyze it the way I would for a Story Grid Diagnostic. In December we're tackling crime stories. For more information, visit our Patreon page. Review a scene from a book or movie in your genre that is similar to a scene you want to work on. For example, if you need help with the opening scene, climax, or turning point, look for the same in your model. What is the POV character’s goal in the scene? Not sure? Look for the inciting incident (the event that throws the character or her world out of balance), and consider what the character wants immediately after that happens. What is (are) the force(s) of antagonism in the scene? Who or what stands in the character’s way? What does that force of antagonism want? Which levels of conflict are present? Think about inner, interpersonal, and extra-personal conflict. How is conflict introduced? Does it rely on dialogue or action? How does the conflict manifest? Is it through a fight, disagreement, bickering, obstruction, personality clash, power differential, or the environment? Use what you’ve learned to review your scenes and revise as appropriate. Thank you so much for sharing your story’s opening with us. We’ve never had a submission from a gaming story universe, and this was particularly fun. 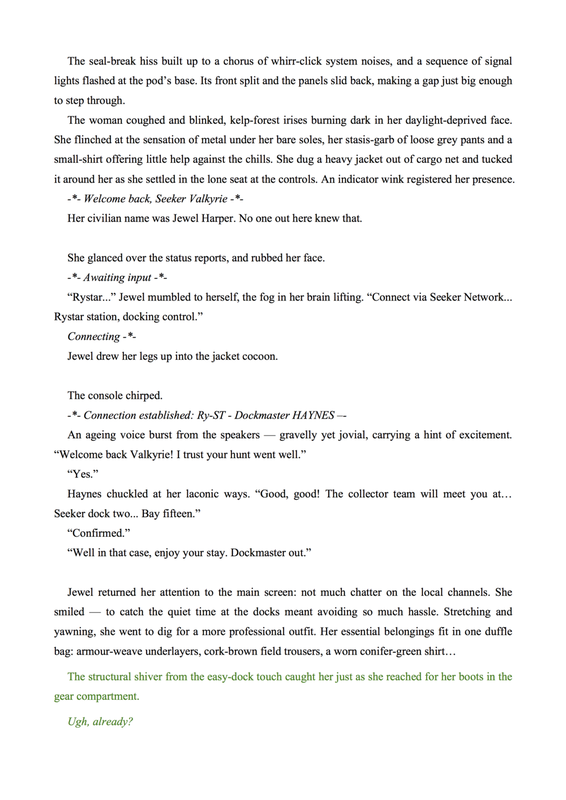 Your prose is clear and enjoyable, which is great for a story that takes place in a world we’re unfamiliar with. Jewel is a great character, and I feel the compelled to follow her on the adventure. From the synopsis, we can tell that Jewel will face plenty of conflict, and our main suggestion for this scene is to hit her with conflict right away. As written, Jewel turns in a prisoner and gets paid for her services as a bounty hunter. There is a change in the scene (Jewel goes from not yet being paid to being paid), but she doesn't face any worsening obstacles or progressive complications in the process. If we look at the elements of the scene or the Five Commandments of Storytelling, we don’t find evidence of conflict. These are different ways of saying the same thing, but I want to include them for the listeners because any one of these is a clue that conflict is missing or not quite strong enough. I didn’t see a true inciting incident for the scene because nothing knocks Jewel or her would out of balance. She has a desire (to get paid), but this arose before this scene started, and nothing that happens here puts payment in jeopardy. Jewel doesn’t face a dilemma because the scene turns with the handoff, which comes at the end and doesn’t push her to a crisis where she must make a decision. Another way to say this is that there isn’t a problem to resolve. If the setup is will she get paid, the resolution or payoff is yes, but no gap arises between her desire or expectation and the goal. We considered whether this scene was meant to be part of the scene that continues, but the next chapter appears to be a complete scene on its own. When a scene lacks conflict (especially an opening scene), it can make it difficult for the reader to become attached to the character. Even when a character desires something we wouldn’t necessarily want, we understand the experience of wanting something badly, and that helps us care about her and want to find out whether she’s successful. Conflict leads us to stakes: Understanding what the goal means to her, that is what the consequences are if she fails, is another way we begin to care about her success right away. So, for example, if the handoff had gone badly, what would that mean to Jewel? Did this job represent a significant investment of time, energy, or money? Is she on the brink of bankruptcy? Did she need to prove herself to someone? Again, in the synopsis of the entire story, we can see that Jewel faces conflict on three levels (inner, intrapersonal, and extra-personal), so it’s not that this is a problem throughout your story. It came to me that the opening is reminiscent of an establishing shot in a movie opening, where we get a view of different aspects of the setting (think Alien when everyone is waking up, the opening credits are rolling, but nothing is happening yet). This works great in film because they add music and images to occupy us as we acclimate to the world. But it doesn't work as well in written stories. The POV character must want something, that is, she should have a goal. The desire/goal arises out of the inciting incident for the unit of story. In other words, the inciting incident for the unit of story occurs and throws the character out of stasis. The desire (to get back to stasis or manage the new reality) comes up for the character. Goals can be of achievement (the character wants to make, do, or become something) or resistance (the character wants to stop or resist something). Another way to classify goals is to think of them as possession of something, relief from something, or revenge for something. A goal is a decision to act. Contrast a goal with something the character is interested in. There’s an old business fable about a chicken and pig who discuss opening a restaurant called Ham-n-Eggs. The pig declines the opportunity on the basis that, while the chicken is merely interested, the pig would be committed. The decision to act should be clear enough that you can imagine the character performing an act that would bring it about. Next, add the opposing force. Someone or something has a goal that is mutually exclusive. Think irresistible force meets immovable object. Conflict can come in different forms fighting, disagreements, bickering, obstruction, personality clash, power differential, environment. Conflict can (1) be contrary to the goal, (2) contradict the goal, or (3) go to the end of the line, what we call the negation of the negation. If the goal is for the character to find food right away, the contrary would be that she has to wait for a couple of hours, the contradiction could be that there is no food on the premises, the negation of the negation could be something like being offered food that robs her body of nutrients (in other words, something like poison disguised as healthy food). You want the level and type of conflict to be appropriate for the scene. Intensity increases as you move toward the climax, for example. The opening scene doesn't need to have a lot of intensity (you wouldn’t start with the negation of the negation), but it’s useful if you can find a way for the conflict in the scene to mirror or be a milder version of a bigger conflict that comes later. Although this is a long discussion, please understand that this is a minor problem that would warrant only a minor adjustment in a story that, based on the synopsis, is working quite well. Thanks again for your submission and for trusting us with your words. There are no line edits this week as we focused on conflict instead. UPDATE: Smith & Kaos revised their opening scene based on our discussion. To see the changes they made, keep reading after the original submission. After hearing our discussion, Smith and Kaos added details to ratchet up the conflict in their opening scene. You can see their additions in green.